Enrol some students in a course. Set "fullnamedisplay" to "alternatename (firstname)"
Set the "alternativefullnameformat" to "lastname, firstname". Edit the "Non-editing teacher" role. Edit the profile of one or two students in the course and set an alternate name for these students. On a course, enrol 2 teachers t1 (Teacher), t2 (Non-editing teacher). Log in as a t1 in a course. Go to the grader report. Confirm that the heading for the name column is shown as "Surname / First name"
Confirm that the names in the table match the "alternativefullnameformat" format. Confirm that the heading for the name column is shown as "Alternate name / First name"
Confirm that the names in the table match the "fullnamedisplay" format. Prerequisites: Have a course Enrol some students in a course. Instructions (Test in both Boost or Clean) Login as admin Open up 2 tabs First tab Goto Site Administration -> User Policies Change 'full name format' and 'Alternative full name format' to one of the approved values(check description) - set the values the same for both Save changes Second tab Go to gradebook Confirm student name header and column values matches the config setting(in 2.1.2) Repeat 2.1 and 2.2 setting different values for the fields specified Additional tests: Log in as admin. Go to Site administration / Users / Permissions / User policies Set " fullnamedisplay " to " alternatename (firstname) " Set the " alternativefullnameformat " to " lastname, firstname ". Save the changes. Go to Site administration / Users / Permissions / Define roles Edit the " Non-editing teacher " role. 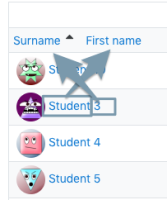 Untick the " moodle/site:viewfullnames " capability. Save the changes. Edit the profile of one or two students in the course and set an alternate name for these students. On a course, enrol 2 teachers t1 (Teacher), t2 (Non-editing teacher). Log in as a t1 in a course. Go to the grader report. Confirm that the heading for the name column is shown as " Surname / First name " Confirm that the names in the table match the " alternativefullnameformat " format. Log in as t2 Go to the grader report. Confirm that the heading for the name column is shown as " Alternate name / First name " Confirm that the names in the table match the " fullnamedisplay " format. The header says surname firstname but in the the table the entries shows the names in the common format firstname surname.